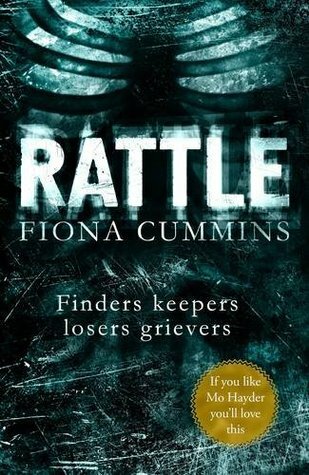 Rattle by Fiona Cummins is a solid debut with an original premise, a great cover and a catchy tag line. Unfolding from several character perspectives, Detective Sergeant Fitzroy is investigating a missing child case in London and soon realises it's more complex than she first suspected. Having three characters with surnames all beginning with the letter 'f' was a little confusing in the beginning. I wasn't sure whether it was intentional or coincidence (in which case it should have been changed) or an 'in joke' which should have been explained in the author's acknowledgements etc. Almost every character was overtired and needed a shower - which was understandable given the circumstances they were in - but chapter after chapter it became repetitive and same/same. What did interest me and kept the pages turning quickly was the pathology of the killer and his collection. 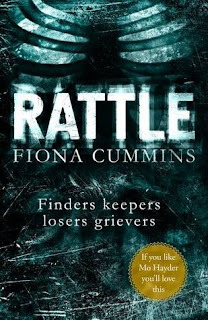 I don't agree with the promo that the killer in Rattle is a psychopath more frightening than Hannibal Lecter, but he was certainly unique; which is often difficult to accomplish in this crowded genre. A great debut and an author to watch.